Camden Travis Street apartments feature luxury one and two bedroom apartments with the best location in Houston’s Midtown neighborhood. Our pet-friendly apartments are perfectly located off Travis Street, right between Elgin and McGowen, with over 140 bars, shops, and restaurants within walking distance. A few of our favorite destinations include Proof Rooftop Lounge, Reef Seafood Kitchen, Randalls Grocery Store, High Fashion Home and YogaOne. Enjoy living a block away from the METRORail, connecting you to all four professional sports stadiums, Hermann Park, the Museum District and the Texas Medical Center. Forget wasting your time in traffic and get ready to enjoy easy commutes with direct access to I-45, I-10, 288 and US-59. It’s time to experience a stress-free lifestyle surrounded by the best of everything Houston has to offer. At Camden Travis Street, each apartment feels like a modern home with features like stainless appliances, granite countertops, custom cabinetry, 10-foot ceilings, garden tubs and large walk-in closets. Enjoy conveniences like covered and direct access parking with elevators, onsite dry cleaning services and at-your-door-trash pick-up and recycling. Named in the top 5 Houston apartment communities with the best customer service, our boutique apartment community is personal, stylish and a truly peaceful place to live. Show off your chef skills at one of the outdoor grills and dining areas, get in shape in the 24-hour fitness center, or just unwind in the resort-style pool with WiFi and cabanas. Entertain your neighbors and friends from the comfort of your own home by utilizing the social lounge complete with gourmet kitchen, billiards, poker tables, and shuffleboard. Camden Travis Street is a pet-friendly midrise apartment community that offers a one-of-a-kind private dog run. Your pets will love it here, and so will you! Residents receive a technology package included in the total monthly rent with a savings of up to 52% off retail. This money-saving package includes high-speed internet up to 150 Mbps and over 140 digital video channels through Xfinity. Use the Xfinity Go app on your smartphone or tablet to access your digital video anywhere! Life in Midtown Houston is urban, walkable, and full of adventure, and Camden Travis Street makes it all home. Visit today and see for yourself. 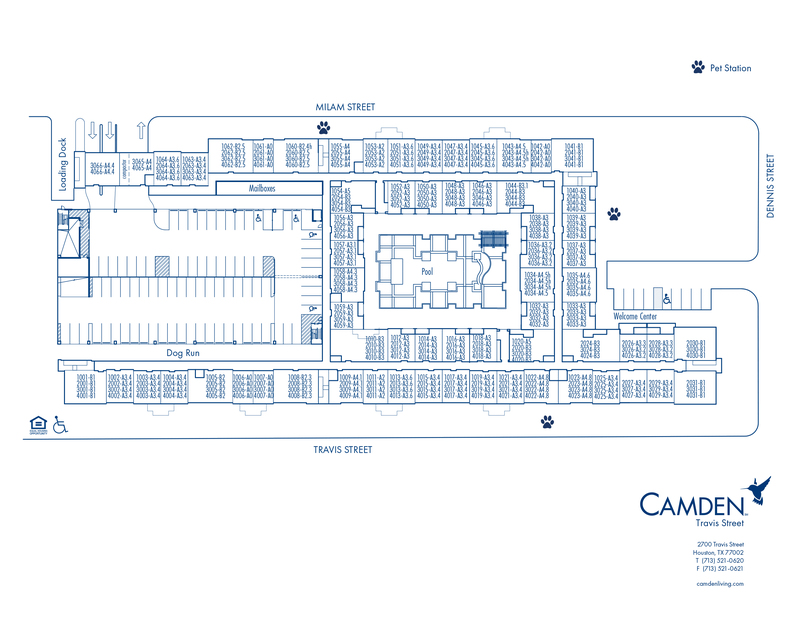 We have ample open parking for our residents in our parking garage - up to two spaces per apartment home. And we have a designated area for visitors on a first-come, first-served basis.